Love him or hate him, Napoleon was one of the greatest soldier-statesmen of all times. He was a successful general by age 24 and became an emperor at 35. A brilliant military genius who conquered half of Europe, he reformed the administration of his empire and gave its people laws that are, sometimes, still in place today. Obsessed with micromanaging, the multitasker Napoleon was very interested in the sciences and literature, and understood the importance of telling your own story. He was always very willing to forgive both his unfaithful wife, his incompetent brothers, and his betraying friends and colleagues. This book, Napoleon: A Life is his ultimate biography. While doing his research, Roberts has visited fifty-three of Napoleon’s sixty battle sites, as well as other places associated with the French Emperor, including the far-away island of St Helena, where he was exiled. He was also able to take advantage of the recent publication of Napoleon’s thirty-three thousand letters, most of which had never been used before, and which give us a new understanding of his complex, multi-faceted personality. The book is decidedly pro-Napoleon. It is clear the author loves his subject, but not so much not to be able to see his mistakes and weaknesses. He criticizes him for it. Therefore, despite the bias, it offers a fascinating and accurate (at least as accurate as it can possibly be) portrayal of Napoleon. Roberts has minutely and diligently done his research, and it shows in each page. The book is packed full of details, and constantly keeps throwing new information at you. This can sometimes make for some dry reading. Especially, if like me, you are more interested in the man behind the emperor rather than the soldier-statesman. A huge chunk of the book focuses on the military campaigns and wars Napoleon fought, while his personal life and his relationship with his wife and siblings take a back seat. But then, packing such an extraordinary life in just more than 800+ pages is no easy feat, and, all things considered, Roberts did it quite skilfully. Casual readers may find it difficult to get through some sections of it, but for any true Napoleon fan, this insightful biography is a must read. 1830s Bermondsey, London’s most notorious slum. After losing his licence to practice medicine, the self professed misanthrope Dr. Thomas Grant opens a tavern in Bermondsey. Everything goes well until one day Wynfiled, a 10 year old orphan badly beaten-up, breaks into his tavern to seek refuge. Once his injuries are treated, Wynfield leades the doctor and police to another orphan, two year old Diana, who is so weak everyone despairs for her life. Diana makes it, but her health will always remain fragile. Her spirit, though, never recovers, and she perceives the world and everyone it bar Wynfield (the two have a complex and dysfunctional romantic relationship, full of love, jealousy, and even hate), as more hostile and evil than they are. Wynfield, on the other hand, is a tragicomic figure. He knows life will never be easy for him and those in Bermonsdey, and he gets involved in some illegal activities, but his idealism, many talents, such as his knife-throwing and dancing abilities, and affable personality gain him friends and the title of “King of Bermondsey”. Despite his nickname, though, Wynfield is a staunch republican who reveres Victor Hugo. His political sympathies attract the attention of influential people who want to use him for their own agendas. Through them, Wynfield learns a few secrets about his past. Wynfield’s Kingdom is a gripping and enthralling tale full of twists and turns. The author vividly brings to life the slums and its inhabitants, stripping all the romanticism from the Victorian era to reveal its darkest side, such as its high crime rate, the deep poverty, and the many orphans that roamed the streets of the capital. Yet, there is a sort of humour that permeates the whole novel, lightening the story somewhat. The impeccable attention to details is shown in the language too. The novel is written in a 19th century style, with characters talking like they would have at the time, giving the novel an old-fashioned vibe that, however, thanks to its humour and the witty dialogue. The novels flows easily and is a pleasure to read. A dark novel with a Dickens vibe, Wynfield’s Kingdom features an engaging plot full of surprises, interesting and nuanced characters, witty dialogues, and a rich, vivid setting that evoke powerful emotions. Highly recommended. Who doesn’t know of the tragic fate of the Romanov family, the romantic love story of Queen Victoria and Prince Albert, and the tumultuous relationship between Henry VIII and his second wife Anne Boleyn, who cost the latter her head? But what if all these stories were somehow linked and what if, hadn’t it been for Henry and Anne, Queen Victoria and Albert would haven’t been able to marry and, in turn, the Romanov family wouldn’t have lost their lives and throne? It sounds like the plot of a fascinating historical novel, but it is actually the blurb of a non-fiction book. Actually, book is not the right word here. Did Queen Victoria & Prince Albert Kill the Romanov Royal Family is a very short work, and reads more like a short essay, or even just the proposal of a book, rather than a book. The author doesn’t invent anything. All the facts, dates, names, events, people, and places are or were real. And the thesis that connects them all is very interesting. But pretty much anything can be linked to something else one way or another, which is why historical sources are needed to back up the claims. Unfortunately, Vukoya doesn’t provide any. She just explains her theory and leaves it at that. Because of that, it fails to fully convince. Although I am unable to give this short work a positive rating, I wish the author expanded it. If it were longer and better documented, it would be a lot more interesting. Although I have never seen a musical or play on Broadway, it is one of the things on my bucket list. The theatre and its history has fascinated me ever since I was a little girl, so of course I couldn’t let this book pass me by. It Happened on Broadway: An Oral History of the Great White Way is just that, an oral history. No, the paper edition doesn’t speak. That’d be quite disturbing! No, it’s an oral story because the recollections of the theater veterans such as Carol Channing, Hal Prince, and Donna McKechnie, aren’t woven into a seamless narrative, but quickly follow one other. Imagine a group of friends meeting up 20 years later for a reunion and each of them, in succession, start sharing his/her memories. Each chapter covers a different topic – their first steps in the industry, the choreography, the flops, etc – so each memory flows well into the next, avoiding confusion or random thoughts that may puzzle the reader. 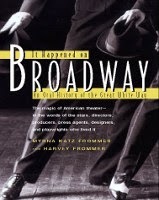 The book offers a fascinating glimpse behind the scenes of Broadway during its beginnings, heyday, and decline, but, in my opinion, it has a major flaw. It doesn’t provide any background information. At the beginning, you can find very short biographies of the theater veterans who have shared their contributions, but there is no further information about the shows they have taken part in and the people they have worked with. As such, it presupposes the reader to be already familiar with several decades of Broadway history. Because of this, it is difficult to say who this book is for. It will definitely make a charming addition to the library of every theatre lover, but the hard die fans may already be familiar with some of the anecdotes mentioned here. Casual reader, instead, will easily be frustrated by the lack of background information and having to google this show or that composer to have a better idea of what the veterans are talking about in the book. But if you love the theatre, it is certainly worth a look.